Avartara Condo. This tidy 1 bed unit is situated in a boutique style condo development located only 50 metres from the Jomtien beach and is within walking distance to popular sea food restaurants, baht bus and other local amenities. The unit is available for rent or sale fully furnished. Title deed held under Thai name and priced at 3,940,000 Baht or for rent at 28,000 Baht per month for 1 year contract. 6 month contract available at higher rental price. 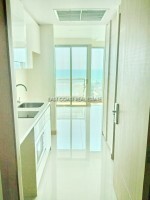 This unit is located on the 5th floor and offers some sea views. The unit is furnished to a good standard and is fully air-conditioned. It also comes equipped with free Cable TV and free WIFI connection. The building has key card access, roof top infinity swimming pool with stunning sea and coastline views, and gymnasium. Title deed held under Thai name with taxes and transfer costs to be split 50/50 between both parties. Owner will also consider renting with a minimum rental period of 6 month upwards at 30,000 Baht per month or 1 year at 28,000 Baht per month.